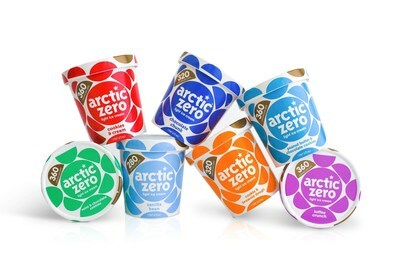 SAN DIEGO, March 20, 2018 /PRNewswire/ -- Sweet news for the millions of consumers who want great-tasting, creamy low-calorie ice cream with a cleaner ingredient profile: Arctic Zero®, the brand that first introduced a better-for-you ice cream alternative eight years ago, is expanding its product line with the arrival of new Arctic Zero Light Ice Cream. Made with real milk and cream – yet only 280-360 calories a pint – Arctic Zero Light Ice Cream is naturally sweetened with cane sugar, making it the only light ice cream pint that does not contain sugar alcohols, corn syrup or other questionable sweeteners. Arctic Zero Light Ice Cream will join the brand's original whey protein-based and lactose-free Arctic Zero Fit Frozen Desserts in grocery freezers this spring. Arctic Zero Light Ice Cream is just 70-90 calories per serving, with the taste and texture of premium ice cream. Arctic Zero carefully crafts its products with clean ingredients. Arctic Zero Light Ice cream is non-GMO Verified, contains rBST free dairy and does not contain sugar alcohols or any artificial sweeteners. New Arctic Zero Light Ice Cream contains only 280-360 calories a pint and comes in seven flavors: Cookies & Cream, Chocolate Chunk, Peanut Butter & Chocolate Cookies, Mint & Chocolate Cookies, Vanilla Bean, Cookie & Brownie Dough and Toffee Crunch. Arctic Zero Light Ice Cream is sweetened naturally with cane sugar and is the only light ice cream pint that does not contain sugar alcohols, corn syrup or other questionable sweeteners. "We heard our consumers loud and clear – even with indulgence, clean ingredients matter," said Amit Pandhi, CEO of Arctic Zero. "Sweeteners are a significant issue of concern and conversation for consumers. Many of the lower calorie ice creams in the category use questionable sweeteners like sugar alcohols that can cause bloating and digestion issues. Arctic Zero Light Ice Cream is naturally sweetened with cane sugar. We want people to feel good after indulging." Pandhi said the team at Arctic Zero obsessed over delivering a premium ice cream flavor and texture experience and worked for months to achieve it. "While many people – particularly those with dietary restrictions – love our original whey protein-based, lactose-free Arctic Zero frozen dessert, others were looking for something more indulgent with a taste and texture like premium ice cream. In the spirit of 'no taste bud left behind' we set out to create a revolutionary everyday indulgence – a low-calorie ice cream that delights and truly satisfies," said Pandhi. Cookies & Cream – An abundance of scrumptious chocolate sandwich cookies mixed into our creamy vanilla light ice cream for the perfect blend of favorite treats in one 90-calorie serving. Chocolate Chunk – The only thing better than chocolate is more chocolate. This pint features our rich chocolate light ice cream with melt-in-your-mouth organic chocolate chunks from Italian chocolatiers; all for just 80 calories per serving. Peanut Butter & Chocolate Cookies – In an unexpected twist on a craveable flavor combo, our peanut butter light ice cream is mixed with chocolate cookies and swirled with real peanut butter for a truly decadent indulgence. Mint & Chocolate Cookie – Sweet, refreshing mint meets fudge-covered chocolate cookies in this 90-cal version of an ice cream classic, perfect for chilling out. Vanilla Bean – Sometimes simple pleasures are the best. Unbelievably creamy, sprinkled with Madagascar vanilla beans and only 70 calories per serving, Arctic Zero Vanilla Bean Light Ice Cream is delightful on its own or as a complement to other desserts. Cookie & Brownie Dough – Dough-M-G! Two sweet-tooth-satisfying mix-ins make this vanilla-based light ice cream flavor twice as nice, with less than a third of the calories of similar super-premium ice creams. Toffee Crunch – The perfect 90-calorie treat for caramellowing out, this flavor features creamy Arctic Zero vanilla light ice cream with caramel swirls and generous chunks of crunchy toffee. All flavors of the new Arctic Zero light ice cream are non-GMO Verified, Kosher and contain rBST free dairy. Arctic Zero encourages ice cream lovers to try the light ice cream flavors by offering a sweet incentive. Those who share their impressions or favorite flavors of the new Arctic Zero Light Ice Cream tagging @MyArcticZero on Twitter or @ArcticZero on Instagram with the hashtag #RealSweetSummer could win a summer's supply of the new product. Arctic Zero will be scanning posts in the month of April to randomly select winners, who will receive all seven pints of Arctic Zero Light Ice Cream per month from May through August to, as the brand puts it, "spread some joy." "Ice cream makes us happy. It puts a smile on your face, an extra skip in your step and it can remind you of the many happy moments in which ice cream played a part," said Pandhi. "That's why we created Arctic Zero – so people can enjoy and take pride in treating themselves well. With Arctic Zero's commitment to clean ingredients, indulgence can feel good, too. There's nothing in our ice cream to interfere with that simple pleasure. It's all good." Arctic Zero Light Ice Cream will be available at natural and traditional grocers in the spring of 2018. Along with the new Light Ice Cream product line, Arctic Zero will debut new, colorful packaging that evokes the pure joy of ice cream. Founded in 2010 and headquartered in San Diego, Arctic Zero is the pioneer of frozen desserts without all the fat and calories. Arctic Zero thoughtfully crafts delicious light and lactose-free frozen treats for every taste bud, giving people choices that they can be proud of and enjoy! Arctic Zero is committed to selecting only clean ingredients – never using sugar alcohols or anything artificial—and offers gluten-free, non-GMO and low-glycemic options. For more information, or to order the new Arctic Zero Light Ice Cream online, please visit arcticzero.com or amazon.com. Follow Arctic Zero on Facebook, Twitter, Instagram and Pinterest.